Zimbabwean opposition leader Morgan Tsvangirai has rejected a compromise plan aimed at breaking the country's political deadlock. A summit of southern African leaders had told Zimbabwe's rival parties they should share control of the disputed home affairs ministry. The call came at the end of a day of talks in Johannesburg by the 15-nation Southern African Development Community. The summit also said it could send peacekeeping forces into the DR Congo. Mr Tsvangirai told reporters: "This issue of co-sharing does not work. We have said so ourselves, we have rejected it, and that's the position. "There is no agreement to co-sharing, to rotation, to swapping of ministries." He said his dispute with President Robert Mugabe was about more than who controls the home affairs ministry, which has the police force under its command. "It is about giving the responsibility to the party that won an election and has compromised its position to share a government with a party that lost," he said. He argued that since Mr Mugabe's Zanu-PF party had control of the ministries of defence and state security, his Movement for Democratic Change (MDC) should control the police. 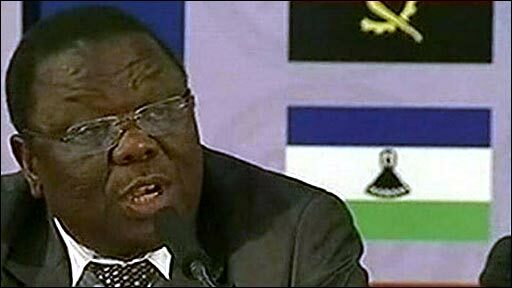 Mr Tsvangirai said he remained committed to power-sharing but was "shocked and saddened" by the outcome of the talks. He told the SADC leaders they lacked the courage to tell Mr Mugabe that his position was wrong. Mr Mugabe and Mr Tsvangirai signed a power-sharing deal eight weeks ago that would see the MDC leader becoming prime minister, but they have failed to reach an agreement on the formation of a cabinet. South African President Kgalema Motlanthe, who chaired the summit, said an agreement on power-sharing "remains the only vehicle to help extricate Zimbabwe from her socio-economic challenges". Zimbabwe is suffering from severe food shortages and rampant inflation. Mr Tsvangirai has warned that a million Zimbabweans could starve to death in a year if the political deadlock continues. Tomaz Salomao, executive secretary of the SADC, said the compromise would mean there would have to be two home ministers, "one appointed by Zanu-PF, one by the MDC". Mr Salomao told reporters that "the SADC was asked to rule and SADC took a decision and that's the position of SADC". "Now it's up to the parties to implement," he said. The BBC's Jonah Fisher, at the summit, says the call effectively backs Mr Mugabe. Arthur Mutambara, head of an MDC breakaway party which is also involved in the agreement, said the offer was "as good as it gets". "If we can do the following - national healing, a new constitution, economic recovery, resolve the humanitarian crisis - just doing those four things, we'll create conditions... to have a proper election in which the opposition can win," he said. "[MDC-Tsvangirai] want more deaths, a few more weeks of deaths, a few more weeks of violation of our rights and then eventually we are going to agree." In the proposed division of ministries, Zanu-PF also has key posts such as justice and foreign affairs, while Mr Mugabe has reportedly agreed that the MDC could have finance. But after the MDC accused the security forces of involvement in a campaign of violence against its supporters during this year's election campaign, it insists that it has a share in running them. Our correspondent says Mr Mugabe has accepted the deal but that Mr Tsvangirai will now hope the matter is taken from SADC and given to other bodies like the UN. The summit also backed an immediate ceasefire in the DR Congo, where rebel fighting has displaced tens of thousands of people. "The security situation in DRC is affecting peace and stability in the SADC and Great Lakes region," the group said, adding that it had agreed to send peacekeeping troops into the Congo if necessary.